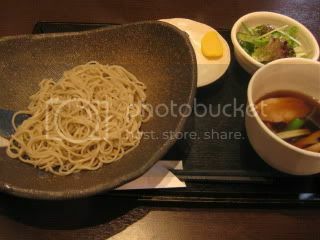 Last Friday, I had soba lunch in Kagurazaka district (Shinjuku) in central Tokyo. 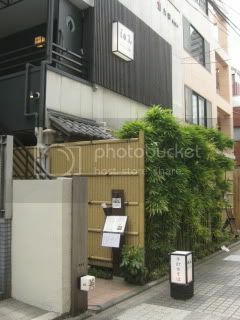 Kagurazaka, where I lived for a few years until right before I moved to LA, is filled with little hidden restaurants and bars on small alleys. My sister and I went to a small soba restaurant called Nagomi, which is run by a owner chef who is from Fukushima. The space had a very nice relaxed ambience. I had Ju-wari Soba ("Ju-wari" means 100%, so the noodle is made with 100% soba flour) with grated daikon. Soba flour was a premium kind from Fukushima. You get to pick 2 kinds of onigiri (rice balls) during lunch time. I had mentai (spicy cod roe) and kombu. Soba had the really nice delicate texture and the flavor was so good. 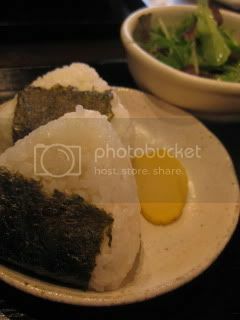 Onigiri was quite perfect, too. My sister had Silk Soba with duck dipping sauce. The noodle is a blend of soba flour and edible silk (from Kyoto). I had a taste and the texture was indeed super silky and nice!